Fourth Row Center: Film Writings by Jason Bailey: Backfilling: "The Wages of Fear"
There’s no shame for a young cinephile quite like that of viewing a picture that is widely regarded as a classic, and being underwhelmed by it. Henri-Georges Clouzot’s The Wages of Fear is ranked in the imdb Top 250, distributed on DVD and Blu-ray by the esteemed Criterion Collection, and gets four stars from Roger Ebert, who calls it a “great French thriller.” I saw it for the first time this week, and while there’s no denying its power and influence, I can’t say it was the kind of essential film I’d been led to believe it to be. Its main problem is that it takes too damned long to get going—the first hour is plenty atmospheric, but good God do you want to light a fire under it. The story, as anyone who’s even heard of it knows, is of four desperate main driving two trucks loaded with nitroglycerin across dangerous Latin American terrain. That’s what we’re there for, and we spend the entire first act waiting for Clouzot to get on with it already. It’s not that there’s nothing of value there, but they could accomplish in 20 minutes what it does in 40 (and reportedly did, in its original, shortened American cut). Once they get on the road, we perk up, but the first leg of the journey is burdened by less-than-convincing rear projection work. We make allowances for the effects of the time, yes, but the problem is that those early scenes function side-by-side with the story’s later, and far more compelling, practical stunts. Those are the scenes the film is known for—the two sequences over the rickety platform, the destruction of the boulder, the drive through the oil—and they are, no doubt, magnificent. But that’s an hour of the movie. What’s my problem? Am I some kind of impatient, anti-intellectual heathen? I hope not. Even Ebert admits that the opening scenes “have a tendency to drag,” and that they traffic mostly in “aimless ennui.” Amen to that, brother Roger. 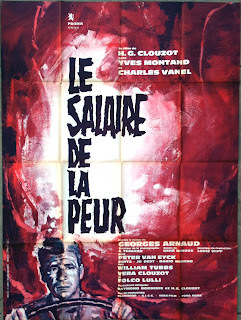 Clouzot was clearly a masterful technical filmmaker, and his suspense sequences are marvelously crafted. But The Wages of Fear is the kind of film where you’re fine sticking with the later, better pictures that it influenced.